Healthcare providers in Nebraska, New Hampshire and Maine are anxiously monitoring hearings in their states as lawmakers debate whether Medicaid will be expanded, while providers in Utah and Virginia will continue lobbying in advance of likely special sessions to settle the issue. Hospitals in these states hope Medicaid will be expanded to adults with incomes up to 138% of the federal poverty level to reduce the amount of uncompensated care. The need is particularly urgent given that they have faced significant cuts in Medicare payments. New Hampshire, seen by many as the holdout state that will expand Medicaid first, got closer Tuesday when its House Finance Committee voted 15-10 to recommend a Senate bill that allows the state to use federal Medicaid funds to buy low-income residents private coverage through the Obamacare insurance exchange. The bill would affect an estimated 50,000 adults. The full House is expected to vote on the bill next week. Expansion is likely as both the House and the governor's office are controlled by Democrats who favor expansion. Providers in the state are desperate for relief. In 2012, New Hampshire hospitals provided more than $425 million in uncompensated care, up about 19% from $358 million the previous year. New Hampshire physicians also want to see a Medicaid expansion. They often find themselves having difficult conversations with patients who may need a costly diagnostic procedure such as an MRI, but don't have any way to pay for it, said Dr. Stuart Glassman, president of the New Hampshire Medical Society. That can lead to a delay in care as they wait to be seen at a public hospital or community health center, he said. In Maine, the state House of Representatives is holding a hearing Tuesday to consider a bill that passed the Senate last week that would expand Medicaid to more than 70,000 people. Even if it passes, the prospects for enactment are dim given Republican Gov. Paul LePage's certain veto and the need for a super-majority to override the veto, said Jeffrey Austin, vice president for governmental affairs at the Maine Hospital Association. While the Legislature is Democratic-controlled, LePage is a Tea Party Republican running for re-election this fall. In Nebraska, the state's conservative-leaning unicameral Legislature has begun debating a bill that would allow the state to use federal Medicaid dollars to buy low-income adults private coverage on the insurance exchange. But it would only expand eligibility up to 133% of the poverty level, which is unlikely to win approval from the Obama administration. Providers are concerned because Republican Gov. Dave Heineman has already said he would veto the bill and it's unclear if there are enough votes to override it. 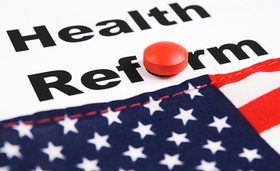 An estimated 54,000 residents would receive coverage under the bill. Nebraska's hospitals are projected to see $1.3 billion in existing Medicare cuts between 2013 and 2022 due to sequestration, healthcare reform and payment cuts, with another $1.6 billion in Medicare cuts under consideration. “Coupled with year over year increases in bad debt and increasing demand for charity care, many hospitals could be forced to reduce services, restrict hours or even close their facilities if Medicaid is not expanded,” said Adrian Sanchez, a spokesman for the Nebraska Hospital Association. “In Maine and Nebraska it boils down to whether the pro-expansion camp can find enough votes to both enact legislation and overcome a veto. This may be possible in Maine but less likely in Nebraska,” said Kip Piper, a Washington-based consultant. Even though their legislatures have adjourned for the year, its likely Utah and Virginia will call special sessions to settle the question of Medicaid expansion. Utah Republican Gov. Gary Herbert sent staff to Washington this week to negotiate an expansion proposal similar to one reached in Arkansas, which includes residents earning up to 138% of the poverty level. He plans to visit D.C. himself in April, according to a spokesman. The state's House and Senate were unable to agree this year on the issue, but have expressed an openness to revisit the matter depending on how negotiations with the Obama administration go. As many as 111,000 adults could benefit if the expansion is enacted. Utah hospital leaders support expansion for adults with incomes up to 100% of the poverty level but have mixed feeling about expanding up to 138% of poverty due to concerns about “crowding out” private insurance. They fear some employers would drop coverage for their low-income employees and send them to buy coverage through exchange plans, which might pay less than employer plans, said Greg Bell, president of the Utah Hospital Association. In Virginia, a fierce political battle over Medicaid expansion continues between the new Democratic governor, Terry McAuliffe, and Republican lawmakers. The matter needs to be settled as the state has no approved budget for fiscal 2015, which starts in July. This is in large part because the Republicans who control the House have not been able to come to terms with the Democratic-controlled Senate and McAuliffe over whether the program should expand. As many as 400,000 people could benefit if coverage is expanded. Providers in Virginia support a model similar to Arkansas' private-plan model for Medicaid expansion, said Katharine Webb, senior vice president of the Virginia Hospital and Health Care Association. The disrupters were from the advocacy group Moral Monday Georgia, and were soon arrested in the public gallery of the Senate and escorted out by Capitol Police and the Georgia State Patrol. The group was concerned about a bill that will formally prohibit the state from expanding Medicaid under the Patient Protection and Affordable Care Act. An estimated 400,000 people would benefit should the state expand Medicaid.